In the Minnesota State fair’s Merchandise Building find a wide variety of headband for underneath the bike helmet. Now that you are there walking around you can think about what you might need. Need a headband that can open up as a bonnet under your helmet to keep the sweat out of your eyes or the sun from the top of your head? In the Merchandise Market Building we discovered a vendor who is offering all types and styles of these headbands. In the Education Building we found the new Minnesota Bike Map, free of charge, in the Minnesota Department of Transportation booth. They were also available in one of the bike exhibits up on the Eco Building. 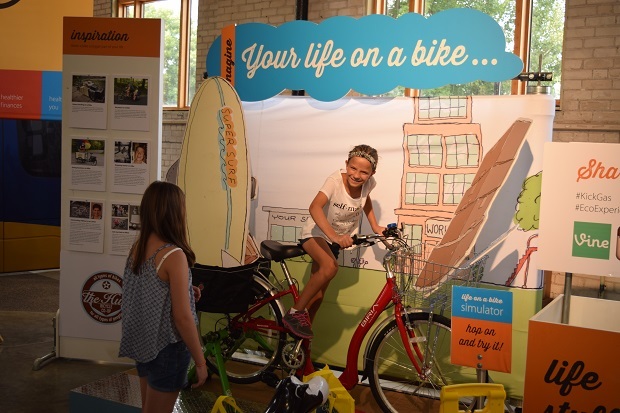 At the Minnesota State Fair , see the Kick Gas exhibit, the “World’s Biggest Bike” hanging in the Eco building. Within the Eco Building, check out a coalition of state agencies and private organizations whose goal is to get more people on bikes more often in Minnesota. And check out the new Kick Gas exhibit with the “World’s Biggest Bike” hanging from the ceiling. You can hop onto a regular bike on the ground below, pedal and watch the gigantic 8-foot bike wheels turn above you. Also, learn what you can do with all the t-shirts you have been accumulating through the years – grocery bags anyone? On Saturday, you can “upcycle” t-shirts into grocery bags to keep green. See more on the Eco buildings schedule and opportunities here. 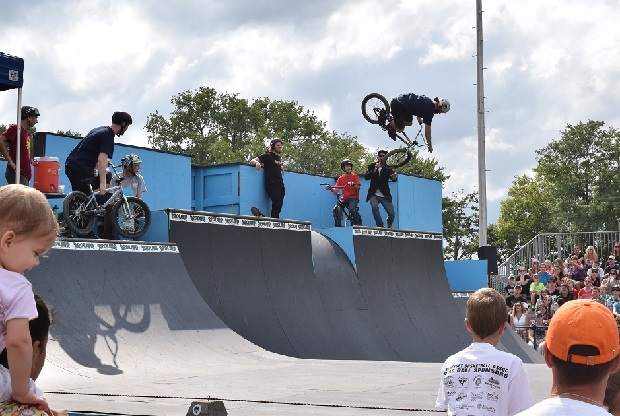 Up in the X-Zone, on Machinery Hill; watch some BMX’ers preform some high-rising stunts right in front of you on the amazing exhibition course there. Is fat biking your thing? A couple blocks south of the stunt riders, we found a bike shop promoting the growing sport of fat biking. Out of Little Canada, The House of Outdoor Gear was there with a wide assortment of fat tire and road bikes. They are also offering some great deals on biking accessories one should check out. In the 4-H building, check out the youths that come from around the state, demonstrate their knowledge in the Minnesota 4-H Bicycle Project. Through presentations and posters they show what they have learned on: how to choose a bike, bike maintenance/repair, and road rules to make riding safe and fun. Hope this helps you for your next visit to the Minnesota State Fair. Did we miss something you found interesting? Please let us know, we would like to add it to our preview article for next year. Send to editor@HaveFunBiking .com. This entry was posted in News and tagged #nextbikeadventure #Minnesotastatefair #onlyinMN, #visitstpaul, Bike accessories, bike to fair, Minnesota State Fair on August 29, 2016 by Russ Lowthian. Plan to ride your bike to the fair? 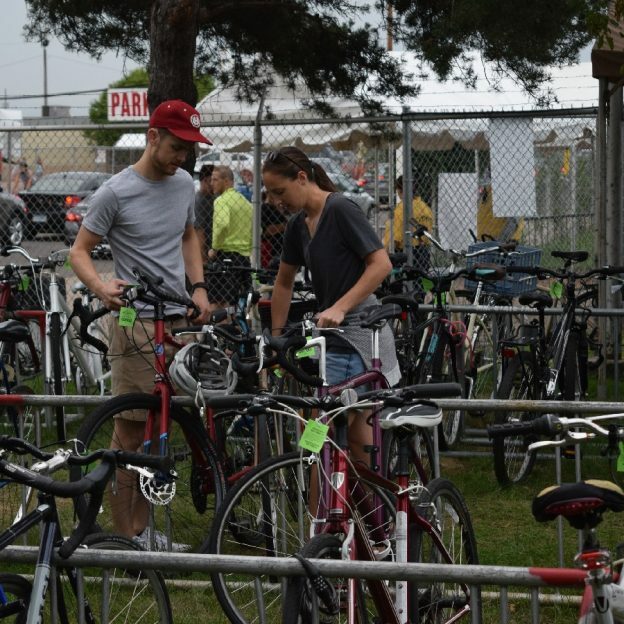 You will find three secure bike corral locations to park your bicycle while visiting the fair. See our recent article for more information on commuting by bike to the fair. Looking for bicycle themed jewelry? In the West End Market we found a wide selection of unique ear rings, necklaces and pendants made by Velo Bling Designs, in their Bicycle Inspired booth. 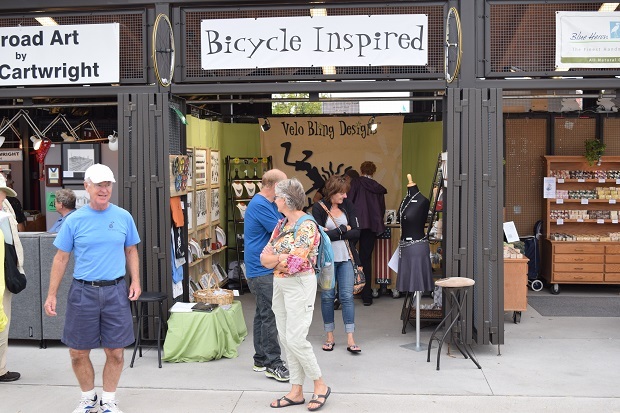 Bicycle inspired jewelry at the MN State Fair. Need a headband that can open up as a bonnet under your helmet to keep the sweat out of your eyes and the sun’s rays off the top of your head? 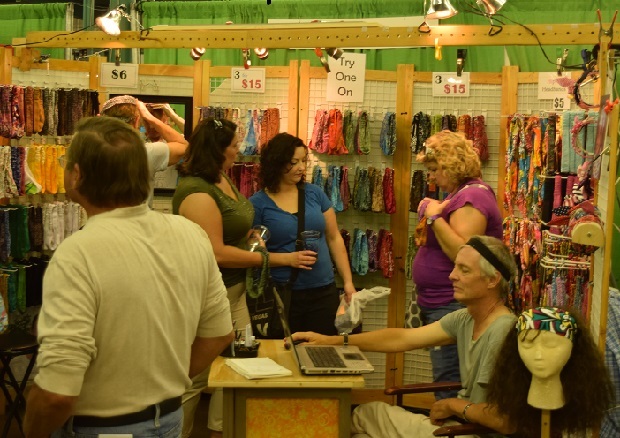 In the Merchandise Market Building we discovered a vendor who is offing all types and styles of fun headbands. A wide selection of headbands were offered here at the MN State Fair. 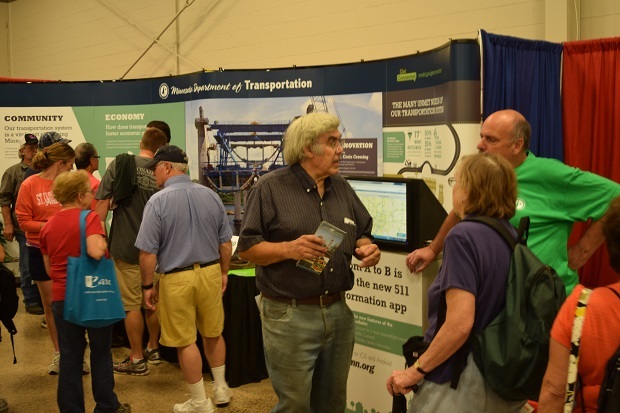 Get your free Minnesota Bike and road maps here at MnDOT’s booth at the MN Fair. 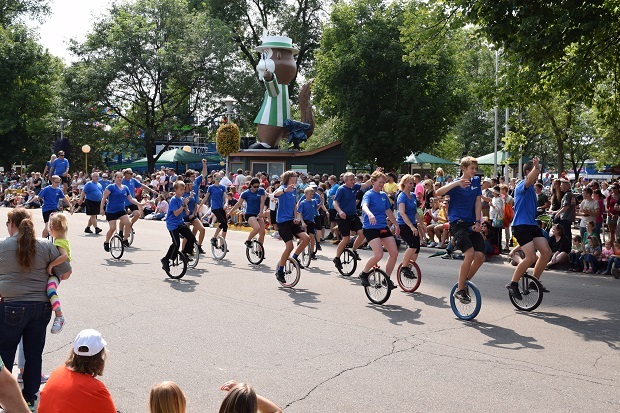 At the Minnesota State Fair Parade, running each day at 2 p.m. on Cosgrove St. you can enjoy watching some of the Twin Cities Unicyclists Club. These single wheeled bicyclists will preforming tricks as they pedal and balance their bikes along the parade route. Where you will also many floats and marching bands. Unicyclists a part of the daily parade doing tricks in between floats and marching bands at the MN Fair. As the parade ends near the Eco Progress Center check out the “Life on a bike simulator” inside. On Thursday, September 3rd. at 9 a.m. and again at 9 p.m. Mr. Michael Recycles Bicycles will have demonstrations in the Eco Building as part of ReUse MN. 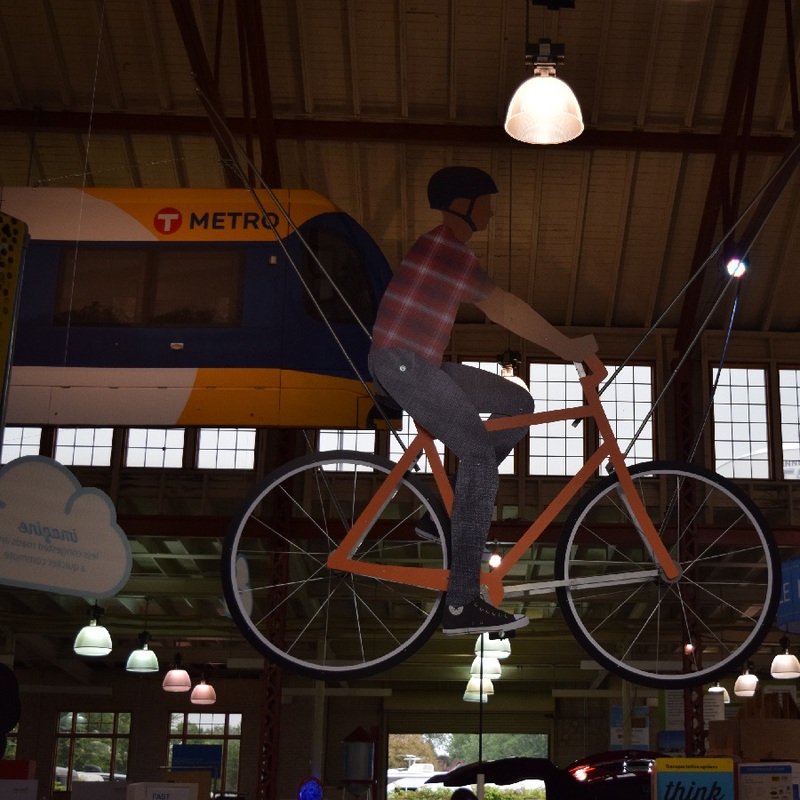 Also in the Eco Building check out how easy it is to take your bike with you when using a bus, at the Metro Transit Exhibit. 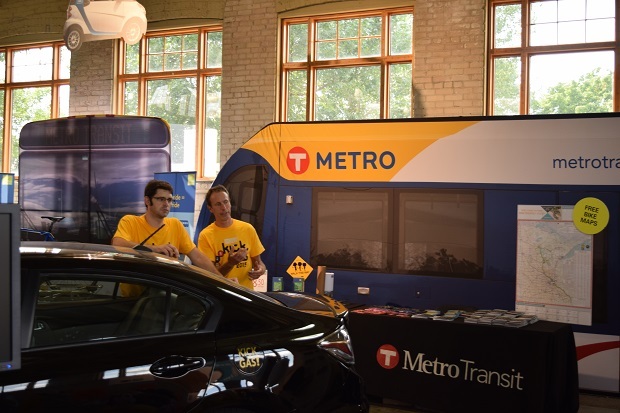 Metro Transit demonstrating alternate transportation options and how to put your bike on a bus. Up in the X-Zone, on Machinery Hill; watch some BMX’ers preform some high-rising stunts on the amazing exhibition course there. BMX’ers demonstration many high adrenaline stunts at the MN Fair. A couple blocks south of the stunt riders, we found a bike shop promoting the growing sport of fat biking. Out of Little Canada, The House Outdoor Gear was there with a wide assortment of fat tire and road bikes. They are also offering some great deals on accessories to check out. 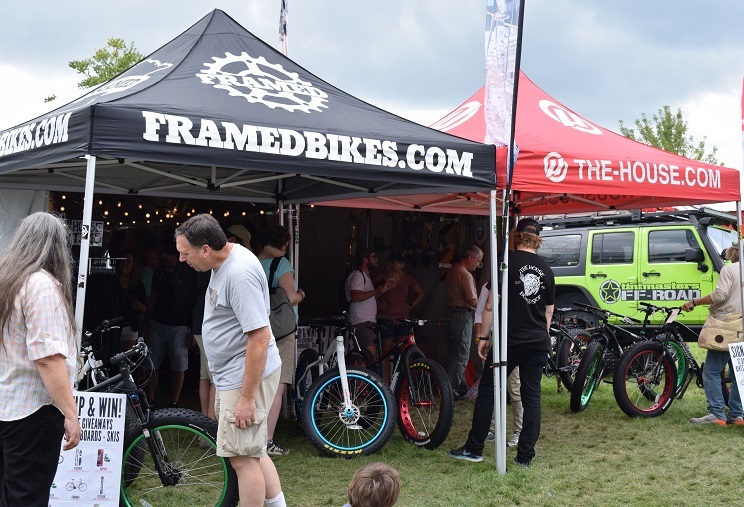 The House Outdoor Gear was at the MN Fair showcasing a wide assortment of fat tire and road bikes along with some great deals on accessories. If you ride your bike in the colder months, here in the Upper Midwest, at one of the Grand Stand exhibits we found had Green Heat brand reusable heatpacks. They just, may be the ticket to keeping your hands and feet a bit warmer this winter. Offering several cold and heat packs, these handy reusable heat-packs can be slipped into a glove or boot. Once activated, the heat packs last for about 30 min. and then need to be rotated. However, after your outing you can place the used packets in boiling water and they rejuvenate and ready to be used again. These are just a few of the bike highlight we found at this year’s fair. Along with all the unique food and fun entertainment we enjoyed did we miss something? Please let us know! We would like to add it to our preview article for next year. Send to editor@HaveFunBiking .com. Don’t forget to check out the 4-H building. Several youth from around the state are demonstrating their knowledge about bicycling through projects and posters with the Minnesota 4-H Bicycle Project. This entry was posted in News, Products and tagged #nextbikeadventure #Minnesotastatefair #onlyinMN, Bike accessories, bike to fair, Minnesota State Fair, St Paul MN on August 30, 2015 by Russ Lowthian.